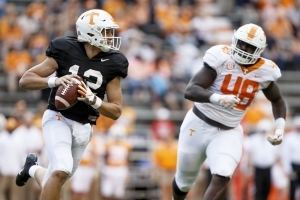 Here are my observations and notes from Tennessee’s 2019 Chevrolet Orange and White spring football game in my blog Vince’s View. Quarterbacks: The only QB for the first team White squad, Jarrett Guarantano, got off to a slow start and missed on some deep throws, but overall did well. He took a sack by free blitzer (Theo Jackson) when the Vols sent a double DB blitz. Either he didn’t get them in the right protection or RT Marcus Tatum blew his assignment. Either way, he likely took the heat from the coaches on that. He connected on a deep ball to Marquez Callaway and he protected the football on throws. Guarantano also cashed in on his redzone opportunities, throwing 4 TD passes. He threw into tight windows with accurate throws on three of those TDs. With the offense being very vanilla in the spring game, I think the true test on his improvement with Jim Chaney will come when they have all the tools in the tool box available in games this fall. The full play book, the answers to the challenges presented by defenses and the best match-ups that present themselves are all things that will show-up more in games this fall. Brian Maurer quickly caught people’s attention with his sharp start with the no huddle, shotgun look they incorporated with him, since he’s most comfortable with that. He tucked it and ran with urgency when he didn’t like what he saw. However, he later took unnecessary chances with poor throwing decisions that resulted in Jaylen McCollough INTs. I also liked Maurer’s encouragement of teammates on the sidelines. It looks like he has natural leadership skills. JT Shrout hit his first throw to Tyler Byrd for a big play, then hit a lull but closed the game strong. He probably had the game’s most impressive throw when he split defenders at the hash to connect with Jordan Murphy for 31 yards. Overall, especially early on, the QBs held on to the ball too long, which was noted by Jeremy Pruitt. Running Backs: The holes were hard to come by for all the backs. Each of the top three backs, including Ty Chandler and Jeremy Banks, flashed with a decent run or two. Tim Jordan was the leading rusher with 39 yards. The most promising thing was showing a little bit of the potential this offense has to split out their running backs and get them in mismatches in the passing game. I asked Guarantano about this enhanced wrinkle this season under Chaney and he said it absolutely will be a weapon for them. The running backs finished with 9 catches. Banks was actually tied for the team high in receptions in the game with 5. Wide Receivers: This is UT’s best unit on the team, in my opinion. Jauan Jennings and Josh Palmer made contested catches for TDs. Palmer validated being named most improved offensive player with a solid game. Marquez Callaway was able to reel in a 52-yard catch on a deep ball that set-up a TD. We saw Tyler Byrd involved in the passing game again. It was interesting to see Jacquez Jones, in his third season in the program from Clearwater, Florida, get an opportunity to catch some passes and flash for the coaches to see. We also saw talented true freshman Ramel Keyton (1 catch for 4 yards.) He needs to add some weight, but I think he has a chance to get on the field this fall. Tight Ends: This is another position that should make a bigger impact under Jim Chaney in the passing game. Dominick Wood-Anderson looked good as the clear starter. The rest of the guys flashed. True freshman Jackson Lowe ran a nice route, caught a ball on the run but then fumbled 35 yards down the field for one of three Orange offense turnovers. Third-year and little used TE James Brown caught a 14-yd TD pass and got some playing time. The issue with this position is blocking. With the struggles of the offensive line, this group has to be able to help block as well. It was a mixed bag on the blocking front. Offensive Line: I thought the tackles had a tougher time than the interior three on the first team. LT Wanya Morris is going to start this season and be a terrific player, but he was beaten in pass protection several times off the end, both with moves and bull rushes. He settled in and got better as the game went on. I thought RT Marcus Tatum, didn’t have his best game as well. The first team offense only had 5 healthy linemen, so they all went the entire game in the same spot. More help is on the way in Brandon Kennedy, maybe Trey Smith if medically cleared and summer enroll Darnell Wright. SEC Network game analyst Barrett Jones said this during the UT spring game. “I think, after talking to Coach Pruitt and some of the staff, that there’s a good chance they’re going to have two 5-star true freshmen tackles on either end in Wanya Morris and Darnell Wright.” I’ve felt there was a great chance of this happening since signing day. However, it’s noteworthy that Jones shared that nugget. Coaches often reveal extra info to national game broadcasters that they don’t during local press conferences. Freshman Ollie Lane has worked at both guard and tackle in practices. He had some tough moments at right tackle giving up quick QB pressures, even though he got better in spring practice. I think guard may end-up being his better spot. K’Rojhn Calbert was probably the steadiest linemen in the game for UT on either side. Another factor to consider is that numerous players played the game at positions that may not be where they will be in the fall. LT Nathan Niehaus could end-up at guard. LG Jahmir Johnson could end-up at tackle. C Ryan Johnson could go back to guard. If Trey Smith returns, with the 5-star freshmen tackles likely starting, I think you’ll see Trey Smith at guard. Those things will add to the remaking of the offensive line in the fall. That is much needed. Defensive Line: This unit probably got the better of the offensive line overall on both sides of the spring game. Aubrey Solomon did a nice job as the bigger, stouter end that this defensive staff wants. Matthew Butler is a little more of the quickness/power DE at the other end spot. He made a few plays as well. Emmit Gooden wasn’t able to get the middle pressure in the interior on passing downs, but he ate-up space and blockers against the run. I thought LaTrell Bumphus flashed pretty well in run defense and pressuring the quarterback, especially considering how new he is to the d-line. Like the offensive line, this is a massive question mark group entering the season, even with three newcomers joining the unit in the summer. UT could really benefit from the NCAA granting Solomon immediate eligibility, if that happens. Linebackers: Several outside linebackers got QB pressures like Darrell Taylor, Deandre Johnson and Kivon Bennett. Inside linebacker Daniel Bituli was named most improved player on defense and he played well. Junior Shanon Reid may have found a home at the Mack (or Will) LB spot with his ability to run and hit. He was a surprise starter in the game and simply led all defenders in the game in tackles with 9. Will Ignont was in a black non-contact jersey, but he still moved between the Will and Mike LB spots exchanging with talented true freshman Quavaris Crouch. They used Crouch to rush the passer from both positions. He is a physical force already as a freshman. I thought Crouch played the run well also, including a tackle for loss. OLB Jordan Allen also had two sacks for the Orange second team defense. Defensive Backs: I thought, overall, this group did a very nice job in the game. They gave-up some catches and lost some battles in the air in the redzone, but they made plenty of other plays as well. I thought the DBs were effective blitzing, like Theo Jackson, Nigel Warrior and Trevon Flowers. All three recorded sacks. I like Warrior at that Star/Nickel CB position covering the slot. He told me in the postgame that he loves playing there around the action. True freshman safety Jaylen McCollough impressed coaches and players throughout spring practice with his instincts and leadership. He paid it off with two interceptions in the game. Jeremy Pruitt said he only remembered him having one interception in all practices before that. McCollough looked great on the INT returns as well. Shawn Shamburger gave-up some throws at cornerback, but broke-up three passes and recorded four tackles. Sophomore CBs Bryce Thompson and Alontae Taylor were solid and should have good sophomore years. Georgia transfer Deangelo Gibbs played with the 2nd unit at the Star/Nickel CB spot. UT would love to get him eligible immediately as well with an NCAA waiver, you know, whenever the NCAA gets around to non-quarterback transfer cases. Special Teams: Jeremy Pruitt complimented the punt returners, Bryce Thompson and Trevon Flowers, for fielding punts well in traffic. It looks like they would like to take that load off the plate of Marquez Callaway. Ty Chandler and Bryce Thompson were very good in kickoff returns. If UT is more aggressive in bringing kicks out this season, I think it will pay off in big returns. That was not the philosophy last season though, where the approach was very conservative. Paxton Brooks out-punted returning starter Joe Doyle. Pruitt has lamented the punting in camp. This team could use those hidden yards that they didn’t get with short high punts last season. Brooks gives them a stronger leg to sometimes flip the field with a booming punt. Brooks handled kickoffs last year and will likely do so this year as well, although starting kicker Brent Cimaglia kicked off once in the game. Brooks was also 1-for-2 in field goal attempts, making one from 20 yards and missing from 46 yards. Overall: The team looked bigger and stronger, both from a second year with the same strength and conditioning program as well as having an improved roster. They still need a lot of improvement in the strength department to catch-up with the big boys in the league. Let’s see if the next 3-plus months can help with that. The spring game had three turnovers by the second team offense, but overall it was a cleaner game than last year without many penalties. Pruitt also did not question the effort of players and he said they had fewer mental errors. The team had fewer major injuries than years past and did not appear to sustain any major injuries in the game. The lone one to watch is WR Josh Palmer, who went down with a leg injury in the final minutes. He was able to walk off with a limp. A number of the players that missed the game were held out as a precaution. That list of scholarship players that did not play in the game is below. There are a couple of things to keep in mind about the players listed as starters at the top. Players listed as starters on the second team may not actually be second in the pecking order (ex. RB Tim Jordan also on the White team first offense and Deandre Johnson also on the Orange team first defense. Both of those guys would likely be ahead of the guys who started on the “second team” in the game. Another thing to keep in mind with the starters is that were players that did not participate due to injuries, health or just precaution coming off injuries. There’s also the chance a summer enroll, like Darnell Wright or Henry To’oto’o, could make an immediate impact and break into the two-deep. Here are the players that did not participate in the spring game. LB – Darrin Kirkland Jr.
Players that return from injuries will add to the competition Jeremy Pruitt is seeking. So will the rest of the 2019 signing class that is scheduled to report this summer. Here are those 12 scholarship players. Find more of my broadcasting work at VinceSports.net.